We stopped by the monthly reception at the Glass Outhouse Gallery last Saturday night. We've never thought about buying art as we'd always thought it was out of our price range. I paid off our parking tickets last month and was shamed by the amount of money down the drain that was. Addressing the causes I feel certain that we can avoid such future charges, and perhaps in a convoluted sense of economy I feel compelled to pay a similar amount, or a portion thereof, on worthy causes. I'm not talking charities, but investments in the people around us. One way is buying art. Considering how much I paid on tickets $70-80 for a lovely small painting or print seems..., well, wonderful. We were taken with two artists in particular: Sandra Litch and Eric Saks. 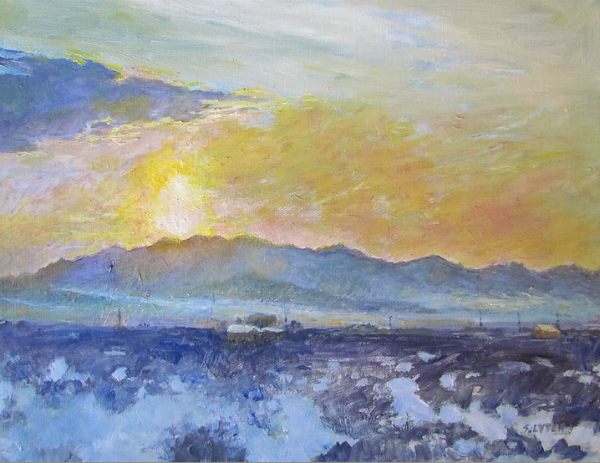 We're buying Sandra Lytch's "Early Morning in Wonder Valley," below. Of course, it's worlds more beautiful in person, luminous and true to the landscape. 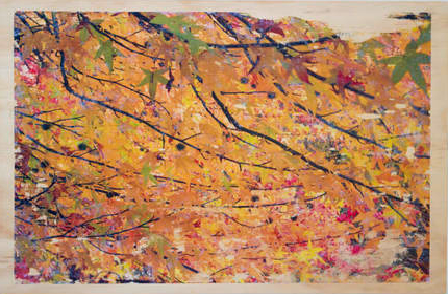 And Eric Saks', Giverney, a color transfer print on wood. Again, much more beautiful in person. I hate to even post these pictures because they fail to convey the beauty. We may, in the future, offer our cabin as an AirBNB vacation rental and I want to showcase local artists, so we're off to a good start. 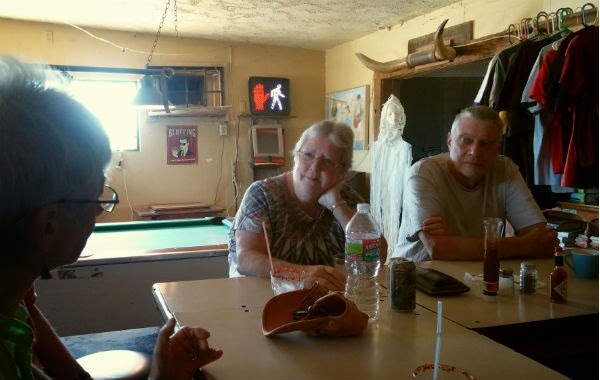 The next morning, on Sunday, we ran into Laurel and Frank, who own the Glass Outhouse Gallery, at church and by church I mean breakfast at the Palms Bar and Restaurant in Wonder Valley. Laurel and Frank are both artists in their own right and have built a community treasure in the gallery. If you haven't been, you've got to go. It embodies the spirit of the community and is a full-fledged joy to visit. Laurel and Frank from the Glass Outhouse Gallery at the Palms Restaurant, Wonder Valley, CA. We'll be picking up our artwork next Saturday, and there's more to buy. It was hard to choose, so if you're interested, stop by the gallery, and bring your checkbook.